← Would The Real Christian Ponder Please Stand Up? 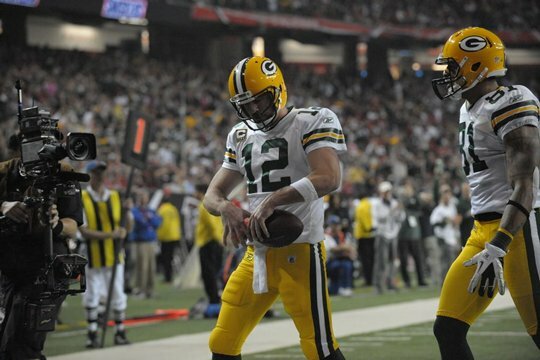 There’s one word to define the 2012 Packers season so far: Injuries. At the bye, the Packers are 6-3, good enough for the fourth-best record in the NFC. Comfortably in playoff contention, the Packers have five remaining divisional games in which to defend its division title. Typically, such a position in the standings is reason for optimism. But with a slew of injuries, you can’t help but wonder whether the mounting injuries will prove too much – even for a team as deep and talented as the Packers. Banged up, the Packers hoped to get through the Cardinals game with a victory in-hand and no more additions to the injury list. The former was accomplished. Not the latter. Already without its veteran leader – Charles Woodson – the defense is set to lose Clay Matthews for “a couple weeks” because of an annual hamstring injury. On the offensive side, the Packers lose perhaps its best lineman in Bryan Bulaga to a hip injury that appears serious. And not to be outdone, Jordy Nelson, returning from a one-game absence, couldn’t make it through the first quarter without injuring his ankle. This appears to be the least worrisome out of the three new injuries. Lose your hard-hitting MLB in the preseason? No worries. Next Man Up. So let’s review. Here’s as full list of the Packers’ injuries this season (and forgive me if I’ve missed one or two – it’s a long list): Cedric Benson, Greg Jennings, Jordy Nelson, Bryan Bulaga, Jerel Worthy, Nick Perry, Desmond Bishop, D.J. Smith, Clay Matthews, Charles Woodson, and Sam Shields. And this does not include injuries that have limited players at some point this season: JerMichael Finley, Mike Neal, B.J. 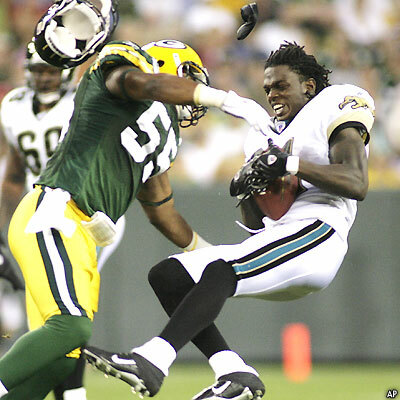 Raji, Davon House, and Jerron McMillian. Finally, we can’t forget players that started the year on the PUP list: Derek Sherrod, Frank Zombo, and Andrew Quarles.Removing the names from the discussion, consider this: the Packers are without their season-opening starter at RB, WR1, WR2, RT, DE/DT, OLB, OLB, MLB1, MLB2, S, and CB. Out of 22 potential starters, that’s 10 different starters and a third-stringer for the MLB position. The Packers pride themselves on the “Next Man Up” mantra. And so far, this mantra has worked as even the loss of Charles Woodson was minimal due to the emergence of so many promising, young defensive backs. The loss of the top two WR’s has resulted in a career year for James Jones and the emergence of Randall Cobb. And even the loss of first-round pick Nick Perry went unnoticed because of Erik Walden’s play. But, it’s the most recent set of injuries that may prove the breaking point for this team. Clay Matthews has almost single-handedly carried this defense to respectability. He leads the team in sacks and effort. He played almost every defensive snap and forced defenses to account for his whereabouts on every play. Without him, the defense loses its identity. And you can be sure it loses its hold on the top spot in the league for sacks. Unlike other injured players, there is simply no way you can come close to replacing Matthews. And it’s not just replacing his stats. It’s a trickle-down affect that impacts the rest of the defenses play. Without offenses devoting game-plans to stop Matthews, that effort can focus on the likes of Raji, Walden, Worthy, etc. The pass rush will suffer. Without a strong pass rush, the pass defense reverts back to 2011 levels. It’s a scary proposition. Similarly, Jordy’s loss leaves a once-deep position rather bare. Jones and Cobb, though dangerous, are not the same players when they are the ones lined up against the oppositions best CB’s. Particularly for Cobb, he needs protection from the likes of Jordy and Jennings out wide to create room for him to operate out of the slot. Without Jennings and Jordy, the offense has stumbled the past two games. Rodgers has struggled connecting with these two, demonstrated by a Christian Ponder-esque 47% completion percentage against Arizona. Finally, Bulaga’s loss shines a light on the thinnest position on the roster: the offensive line. To replace him, the Packers will move LG T.J. Lang to RT and insert Evan Dietrich-Smith at guard. What’s left, due to Sherrod’s injury, are undrafted free agents Don Barclay and Greg Van Roten. The Packers can skate by with Dietrich-Smith and Lang. But one more injury – say to a long-in-the-tooth center – and, well, things could get ugly. Fast. A pissed off Rodgers is nearly unstoppable. Despite the negativity, all is not lost. The Packers are still 6-3 and still have #12. Remember, Rodgers thrives on haters and doubters. Even with a depleted roster, look to Rodgers to take this team over and will it to key victories. I have little doubt the Packers land a playoff berth. And when that happens, watch out. A healthier Packers team, fueled by doubt is as dangerous as they come. This entry was posted in Home, Vikes v. Pack and tagged 2012 Green Bay Packers, Aaron Rodgers, Bryan Bulaga, Bulaga injury, Clay Matthews, Don Barclay, Erik Walden, James Jones, Jordy Nelson, Jordy Nelson injury, Matthews injury, Next Man Up, Nick Perry injury, Packers bye, Packers injuries, Packers offensive line depth, Packers starters injuries, Randall Cobb, Replacing Matthews, Replacing Perry. Bookmark the permalink. FFChamps.com — Green Bay receiver Jordy Nelson (ankle, hamstring) is expected to be “fine” after the Week 10 bye, Packers coach Mike McCarthy said. SOURCE: Bill Huber of PackerReport.comFantasy Spin:Nelson started Sunday despite a hamstring injury but left due to an ankle sprain early in the game. The bye week should give both injuries ample time to heal.